This is the third illustration in this series of four. The scene shows the man & woman (representative of us all) crossing the great wooden cross, which is the “bridge” in the title. Only by coming to the cross of Jesus Christ can our sins (wrongdoing) being dealt with once & for all. Only once that has happened, can we be reunited with the Lord God. The source of light in this scene is from the river of lava, beneath the man & woman. The red hot lava casts a yellow/orange light up into the scene. 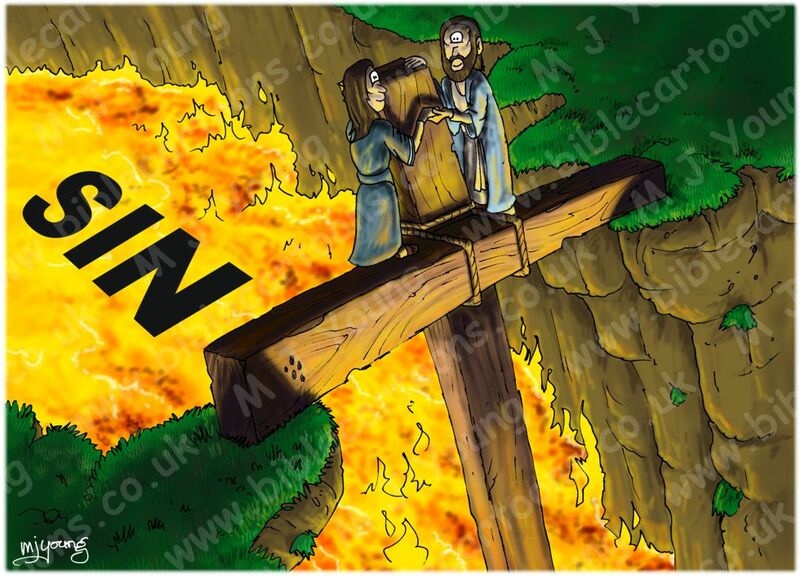 The man & woman (after the fall in the garden of Eden) separated from God by a wide chasm of lava. Here they are climbing over the bridge, which is the cross of Jesus Christ.